I don’t know very much about the history of these transformers. What little information I do have comes from Richard T. Ammon’s preliminary book, The Rolls Royce of Reception. The company started out as the American Radio Manufacturing Company in 1925 but changed their name to the Standard Wave King in 1926. Advertisements show that the IF frequency was 45 KC. However, my measurements of the IF frequency indicate a peak frequency of about 145 KC. There is no manufacturers name on my transformers, so I don’t know for certain that my set of transformers were manufactured by American Radio. Here is a set of American Radio IF transformers that were on eBay in May 2018. The seller had parted out the radio and listed the individual parts separately. The radio was apparently a basket case so it probably wasn’t a big deal, but I would have liked to see what it looked like before it was lost to history. At least the seller listed the resistance measurements of the transformers and included some photos that I obtained some information from. This is good information if your label is missing, or disintegrating beyond recognition, as this label has just about done. The table below records the resistance values of the transformers. The primary coil on the filter transformer has a lot lower resistance than the primary coil on the other transformers. It’s smaller than the primary coil on the other transformers, and possibly wound with a heavier gauge wire. 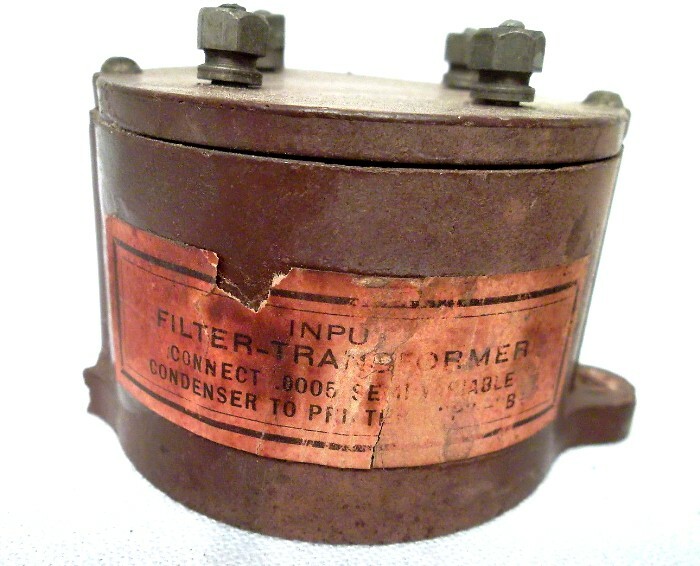 Given a peak frequency of 145 KC and a primary capacitance of about .00025 MFD, it wouldn’t be too difficult to modify one of my transformers into a filter transformer.